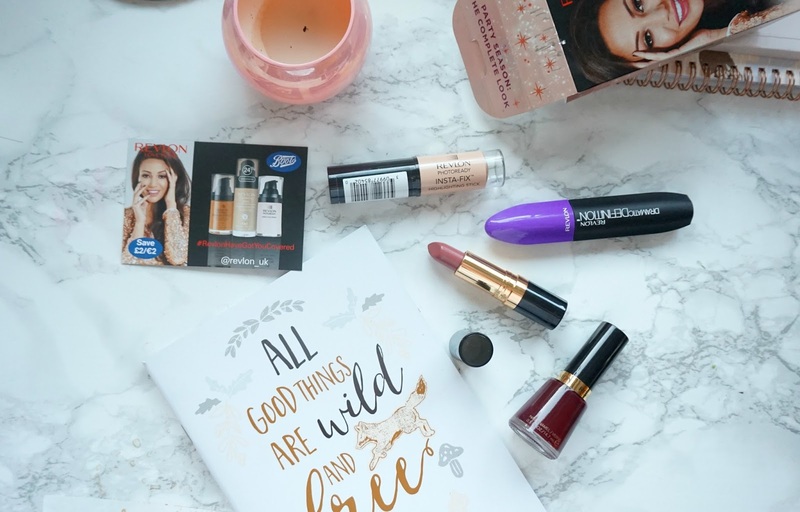 Hello lovelies, just a little post today but I couldn't not share it with you all, look at all these freebies you get if you spend just £15 on Revlon products. I'll be honest it was hard for me to spend £15 on Revlon as I don't really like their foundations, I have way too many lipsticks so I treated my nan to a mascara for christmas and I picked up a lip pencil, I think Revlon is more in the pricier range for drugstore/highstreet beauty products. However when I saw you got free four full sized products after you spent £15 I was tempted as I loved everything inside there. Usually make up brands tend to go for a red lip in their little festive freebie boxes near christmas so I was happy they put a pretty mauve lipstick in there instead, one of my favourite lip shades! I was also intrigued by the highlighting stick which I believe is a new product by them, I'm still new to highlighting sticks myself, I tend to just do a light dusting on my face with powder so I'm looking forward to trying this. I'm going to paint my nails in this shade tonight, perfect for autumn winter with a glittery accent nail and I'm not in love with the mascara yet but I think it's great for 'natural' make up days, it feels really light on my eyelashes but gives them a little more definition. All in all it is worth spending £15 to get these goodies whether you need to top up on your favourite Revlon products and give this as a stocking filler to someone for Christmas or you could treat them to a Revlon product and keep the freebie for yourself, you even get a voucher for £2 of their foundation and primers. Boots have a lot of free gifts going on at the minute in the make up section but the Revlon one was my favourite by far, the soap and glory one looked pretty cute too though.